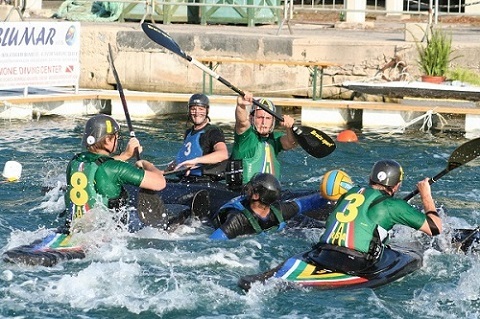 Team South Africa are eyeing a strong showing at the Canoe Polo World Championships in Syracuse, Italy, from August 30 to September 4. Team official Nicole de Bree said the team had settled well and were getting used to playing in salt water as opposed to fresh water. “The team had a warm-up game against Brazil on Sunday which they lost 2-0. The game, however, did help the guys get used to the conditions as the ball gets more slippery in salt water,” said De Bree. South Africa will have a tough task in their opening game against Switzerland on Wednesday. With two other challenging games ahead, they will need to draw on the experience of those who have competed in the senior division at World Championships before. The team will be trying to use their performance as a means to grow interest in the discipline in South Africa among the youth. Canoe polo, started in England in 1970, is one of the competitive disciplines of canoeing, known simply as “polo” by its aficionados. Polo combines canoeing and ball-handling skills with an exciting contact team game. There five players in each team, who compete to score in their opponents’ goal which is suspended two metres above the water.